The more I read about medieval towers the more I understand why a blasted tower is such an archetypically terrifying image. In war time often the only thing that stood between a person and certain death was a secure garrison. 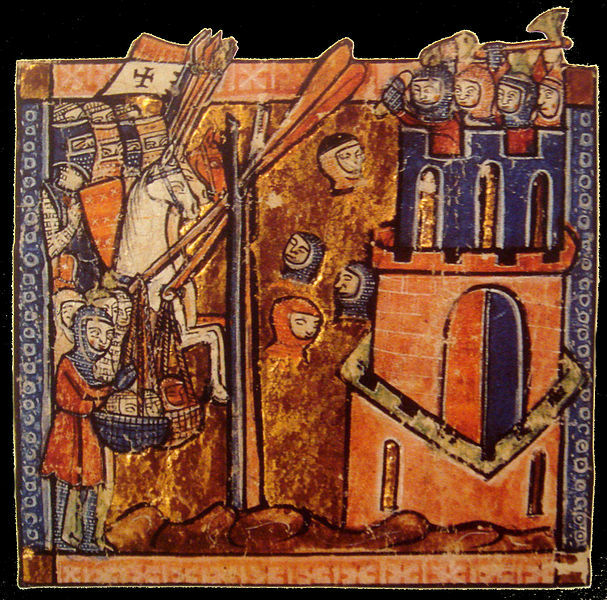 The image above depicts an infamous episode during the first crusade - the Siege of Ma'arra (now the Syrian town of Ma'rrat al-Numan). The defenders of the city consisting mainly of an urban militia and citizens managed to hold off the attacks for about two weeks. During this time the crusaders constructed a siege tower enabling them to pour over the walls of the city, while at the same time a group of knights scaled the undefended walls on the other side of the city. The crusaders occupied the walls on December 11. On the morning of December 12, the garrison negotiated with Bohemond who promised them safe conduct if they surrendered. The Muslims surrendered, but the crusaders immediately began to massacre the population. On January 13, 1099, under intense pressure from his followers, Raymond gathered his forces and continued the march to Jerusalem. Around this time an indeterminate number of soldiers reportedly ate from the flesh of enemy dead. 'Some people said that, constrained by the lack of food, they boiled pagan adults in cooking-pots, impaled children on spits and devoured them grilled'. What the chroniclers stress is that the crusaders ate only Muslims - when there would have been, probably many dead Franks, and Syrian Christians. This suggests that the cannibalism had a meaning beyond the simple need to survive. Based on a review of the sources Jay Rubenstein argues that cannibalism was not confined to a single incident of famine and that it was not always a response to hunger. Rather than being an aberration from the ethos of holy war it was an integral aspect. In Peter Tudebode's chronicle the cannibalism is secret, anarchical and upon discovery by the crusade leaders immediately suppressed. Shocking though it is, it is explicable from a medieval perspective. Homegrown cannibalism was not unknown in famine and war riven eleventh century Europe. This was psychological warfare with religious justification. The city is a stewpot in which the enemies of God are cooked alive and consumed by his holy warriors. The Franks saw themselves as vessels of God's will and God’s wrath not in spite of brutalities such as cannibalism but because of them. According to Rubenstein a plausible reconstruction is that cannibalism occurred in the Crusade's first experience of scarcity. However by the time the army reached Ma'arra some of the soldiers recognized its potential utility and, hoping to drive the defenders into a quick surrender, made a spectacle of the eating, making sure that Muslims were the only ones eaten. I'll never understand the crusades, if I live to be 1000 years old. Or the Spanish Inquisition. Or any religion that thinks it and it only has the keys to a mythical heaven. Thanks for sharing. Yuck. I never read that part of history of cannibalism. I am not surprised though. Humans can do horrific things in name of Righteousness. We still suffer so much from mans inhumanity to man. I knew the crusades were brutal but until now deliberately avoided finding out how exactly. I suppose mans inhumanity to man continues partly for similar reasons - people don't want to confront it. Oh my you have big brains.....that is exactly what Jay Rubenstein discusses in his contextualisation of this phenomenon. i forgot to post a link to his article. Will do so later.